Wide selection of Tac-Force spring assist knives, throwing, hunting, survival, pocket knives, self defense items, all kind of swords and daggers. We offer excellent quality products at a very low cost guaranteed and great customer service! We will beat or match any price. 10% discount on orders over $100.00! Buy Blank Guns, Airsoft Guns, Knives, Swords, Daggers, Assisted Opening Knives, Throwing Knives, Sword Canes, Stun guns & much more at Wholesale prices. Only $50 Minimum! Call us toll free at 1-877-286-4139 or Visit www.SharpImport.com for more info. Exceptional customer service guaranteed! Manufacturer, importer of Riteedge brand, Steelstag, Damascus and hand-made pocket, throwing, display, wildlife, guthook, Spanish, french, folding and hunting knives. Hand-made ninja, samurai, Scottish, medieval, full tang, wooden, Celtic, katana, rapiers swords and sets. Scissors, hemostat, tweezers and more. We carry large variety of Wholesale Knives, Daggers, Swords, Hunting Knives, Survival Knives, Binoculars, Crossbows, Soccer Balls, Basketballs, Tummy Belts, Nail Clippers, Scissors, Flasks and more. Wholesale prices are listed on our site for all items. We stock over 6500 different item's in "OUR" warehouse! No middle man or extra drop ship charges. We carry a wide variety of items from hardware to licensed goods. We add new item's "Every Day"! $100 minimum order on products such as stun guns, pepper spray, spy cameras, novelties, sporting equipment, books, clothing, air-soft guns, air rifles, crossbows, knives, Boker, outdoor watches, Gerber, Kershaw, Lansky, Crossman air guns, Leatherman, Smith & Wesson, Columbia River knife & tool. Discover the gold mine in your backyard. 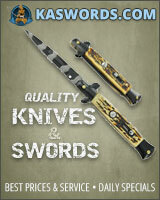 Knives4Wholesale Online Since 2005! Wholesale Supplier & Distributor Of Automatic Knives, Lightning OTF Knives, Titan And Titan 3 OTF Knives, D/A And S/A OTF Automatic Knives, Butterfly Knives, Italian Switchblade Knives, Spring Assisted Opening Knives, Novelties/ Gifts And Much More! FREE SHIPPING ON $699.00 WHOLESALE ORDERS IN USA! Wholesale supplier of Airsoft, Knives, Tactical Gear, Toys, Novelties, Handbags, Sunglasses. We have the largest selection of AIRSOFT on market! Lowest PRICES! Best service! Fast delivery. Are you looking for the best wholesale distributors of durable and latest products? WholesaleBlades is the one for you then as we provide top-notch products at very affordable rates. Buy Six or more items of the same product, you Get a FLAT 20% Off that product. Only $25 Minimum order requirement. We also Offer free dropshipping with no minimum.